Hi everyone, today’s card is gorgeous! It is one I have CASED (Copy And Share Everything) from page 3 of the Occasions catalogue. What really appealed to me about this card is that it featured colouring, the trellis die (from the Rose Trellis die set) and ribbon. I rarely use embellishments such as ribbon and I thought this looked so sweet. I also like the fact that the card actually looks like it might be a bit of work…but I knew it wouldn’t be. Before running the trellis die through the Big Shot, I added the Multipurpose Adhesive Sheet to the back of the Whisper White cardstock. I LOVE this adhesive. I use it for all my fiddly dies these days. I then adhered this die cut directly to the vellum. I was then able to use the fine tip glue to adhere the vellum to the coloured panel. 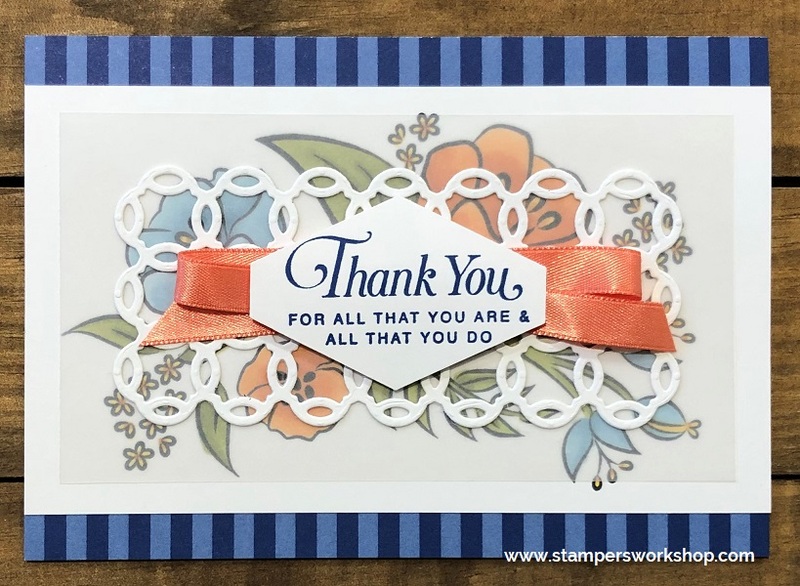 To finish the card, stamp the sentiment of your choice in Blueberry Bushel ink then punch out with the Tailored Tag punch. I added a little bit of snail adhesive to the card to secure the ribbon and then popped up the sentiment tag over the top. So cool! Isn’t it lovely! You could make this card more of your own by using a different colour palette, sentiment or die cut/punch for the sentiment. I think it is easily replicable and I hope you will give it a go!